“Muralmorhisis”, painted in collaboration with 13 youth apprentices for the Police Athletic League, is a story of personal transformation, of learning from our past mistakes and listening to our elders to move forward through life and reach for greatness. The first week of the research process for the mural, the group focused on team building and brainstorming ideas of their own, discussing issues that were important to them in their personal lives and those of their peers. The following week, the group conducted interviews in the community and among the staff at PAL. 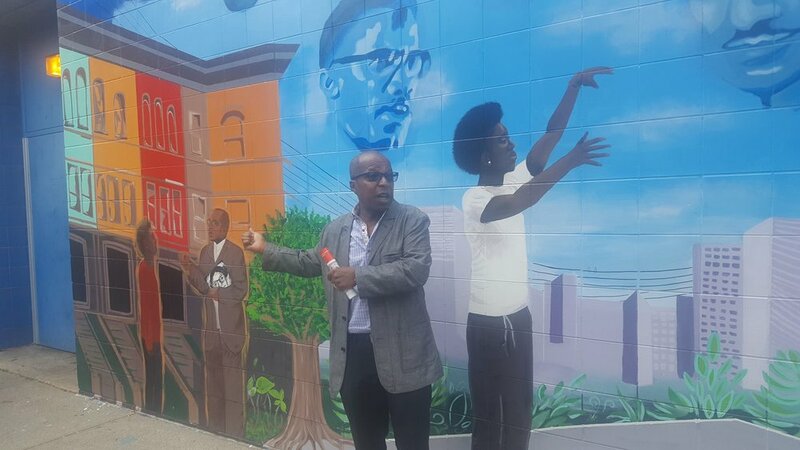 We took a historical walking tour of the neighborhood to learn about the civil rights movement and the Harlem Renaissance, and visited the Apollo Theater where the group was introduced to Billy Mitchell, the director of the theater and an inspiring mentor. After gathering feedback from the community and the stakeholders, and inspired by the rich history of protest in the community, the group decided to focus on the topic of police brutality and human rights. 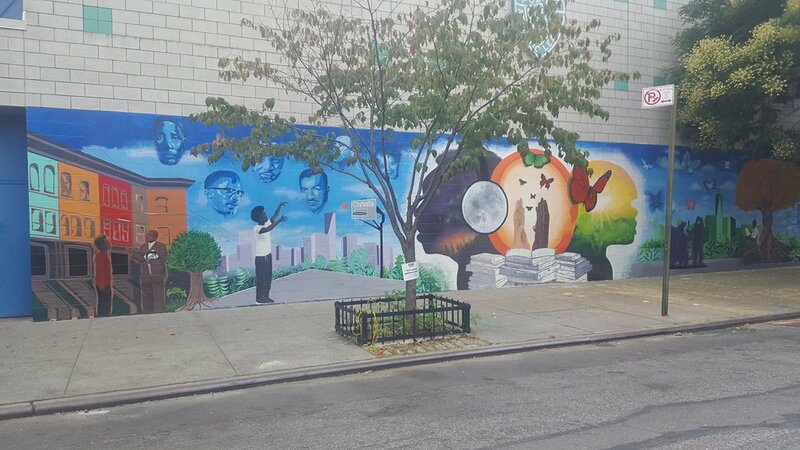 The mural moves through time with the left side representing the past and those that came before us, depicting the images of great civil rights leaders such as Malcolm X, Adam Clayton Powell, Mohammed Ali, Maya Angelou, and Harriet Tubman in the clouds, reminding us of what was fought for. Billy Mitchell, the director of the Apollo Lounge, can be seen holding a picture of Claudette Colvin and talking to a young man about life and giving him advice. Not far from them is another young man, shooting for change. The middle section of the mural depicts a transformation, with a pair of hands, supported by a stack of books, releasing a flock of red, black and green butterflies. The face to the left is filled with a night sky and looks to the past to remember the lessons of our elders. The face to the right is filled with a sunrise and looks to the future. In the right section we see a vision of the future, with a beautiful tree with deep roots and a twisted trunk to represent unity and togetherness. A young man sits under the tree sketching or writing, turning his energy towards creative endeavors. And the children play and reach for the butterflies that contain African symbols for unity, harmony, greatness, and love. A train runs through the entire mural, representing the continuous progress of time.